Frank Lloyd Wright was the 20th century’s greatest architect. Known primarily for his building designs, he also created the furniture, stained glass and housewares for his homes and offices. And oh yes, he was also an illustrator. 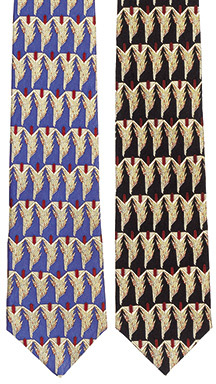 Our Frank Lloyd Wright Tie Collection draws upon many sources for unique designs presented here. The Prairie Sumac is based on art glass window designs from the Dana Thomas House in IL. Ties are 100% silk.